Avalon II is an updated version of the original Avalon video slot game from Microgaming. The player is greeted by Merlin as they start playing Avalon II, who becomes their guide throughout the mystic world that is the setting for the Avalon II online slot. The player takes part in the legendary grail quest, and will hopefully win some riches on the way. A great new take on a classic online slot game from Microgaming. Everything about Avalon II scream quality. The original Avalon slot has been one of the most successful launches for Microgaming ever, and Abalone II picks up on that success and updates it. With a massive number of 8 bonus games, 5 reels, and the Microgaming 243 ways to win feature, this should be an incredibly fun video slot game to play. It comes equipped with all of the modern gameplay features we expect from a new video slot and this includes a wild symbol, scatter symbol, free spins and the previously mentioned 8 separate bonus features. Graphically, Avalon II is simply amazing, as the player is greeted by Merlin, who becomes their guide, and begins the grail quest, following the legend of King Arthur. Visiting mystic places, all of which are graphically stunning, with excellent ambient sounds and music. Make no mistake, Microgaming has really gone the whole hog with Avalon II, this is one of the best looking, most fun to play video slot games that the company has ever developed. The wild symbol that is included in the gameplay features of Avalon II works in two ways. It works as a standard wild symbol, substituting for other symbols to create wins, and it also works using the Microgaming patented Trailing Wilds system. So the wild symbol is an important part of the gameplay for the Avalon II online slot game. 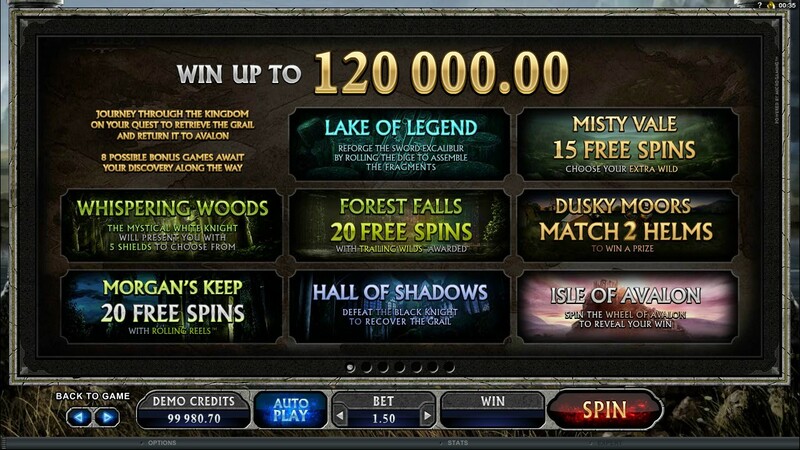 The scatter symbol is incredibly important within the gameplay features of the Avalon II online slot from Microgaming. It is the scatter symbol that triggers the 8 level bonus feature, more on that below. This feature is triggered by spinning in 3 or more scatter symbols whilst playing Avalon II, and this is a major gameplay mechanic that shapes the entire game. 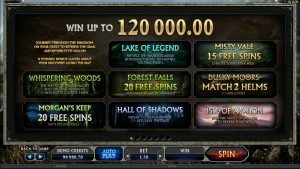 The new Avalon II online slot from Microgaming does include free spins, but not in the traditional way. Instead, free spins make up part of the 8 stage bonus feature, so in many ways these free spins are quite innovative. The player doesn’t simply spin in 3 scatter symbols and then get some free spins, they need to open up the bonus feature. The 8 stage bonus feature that is part of the Avalon II online slot is possibly the most amazing bonus feature ever. The 8 stages of the bonus feature take the player on a journey to find the Holy Grail. Each of the 8 stages is set in a different location, and each is a different side game, some of which include free spins. Completing one stage successfully sees the player gain access to the next stage.